On February 15, 1969 twenty-one retired teachers met at the Arcanum Public Library to form a county chapter. Leah Huston of Greenville became the first president. 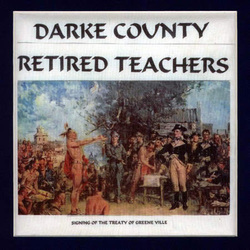 The chapter was granted a charter by the National Retired Teachers Association in 1973.The current membership of 154 includes retired teachers from Ansonia, Arcanum, Bradford, Franklin Monroe, Greenville, Mississinawa Valley, Tri-Village and Versailles. One teacher from these districts is chosen each May as Darke County Teacher of the Year.Genevieve Albright, a Gettysburg teacher, served as president for the Ohio Retired Teachers Association in 1987, Thelma Ross of Greenville was District III Director in 1986-1989. Current members are active volunteers in the community. Member donations, a garage sale and a conitnuing book sale add money to the scholarship fund. A scholarship is given every spring to a graduating senior from a county school who plans to major in education.